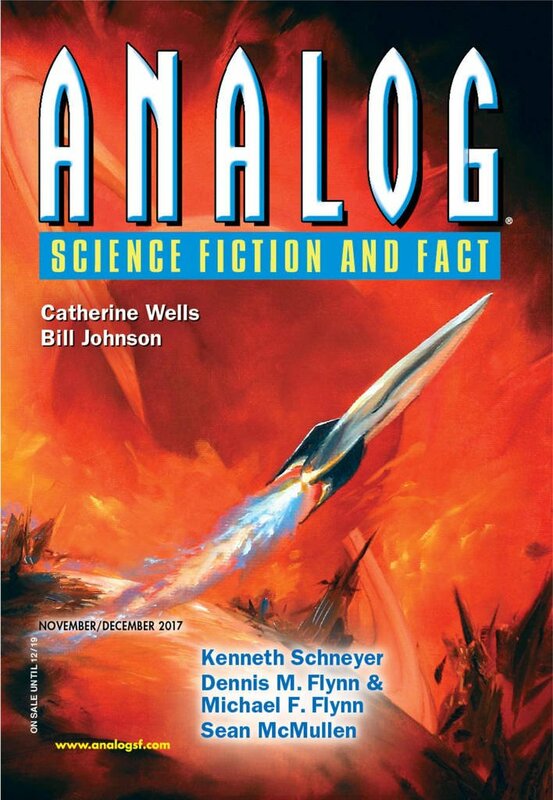 "Keepsakes," by Kenneth Schneyer [bio] (edited by Trevor Quachri), appeared in Analog Science Fiction and Fact issue 11-12|17, published on October 19, 2017 by Penny Publications. Doru, who wants to reunite with Afzal. Afzal, who wants to win his case. Eugenia, who wants justice for her dead mother. The Keepsakes interact with all three in different ways and shed light on what happened to them over the years. Doru was more confident as a young man, and although he’s had at least a measure of success, he’s let his pining over Afzal ruin his life. Deleting the Keepsake at the end suggests that, at long last, he’s finally ready to move on. Afzal has turned into a cold-hearted monster. Even as a young man he had a lack of regard for other people’s feelings, but now he seems to have none of his own. Doru makes his Keepsake miserable by leaning on it, but Afzal actively tortures his, and there is no indication that he intends to stop. Eugenia was perhaps too quick to believe the Keepsake. The whole idea of repressed memories is controversial.) She might have really seen something, or she might just have had a vivid dream that she confused with reality. However, since she didn’t remember her mother at all, by asking her Keepsake to tell her about her she is the only person in the story who actually finds a wholesome use for it. Con: It’s hard to like any of the people in this story. Doru is too pathetic. Afzal is too cold. Eugenia just isn’t filled in enough. The most sympathetic character is probably Afzal's Keepsake. Him we really feel sorry for. Him and the child. Also, given the intensity of Doru’s feelings, it’s very hard to believe he went 23+ years not trying to communicate with Afzal.